In Art and Chronic Pain – A Self Portrait, artist Soula Mantalvanos shares her experience with chronic pain, which has been a debilitating presence in her life for almost seven years. Soula suffers from Pudendal Neuralgia, a painful nerve condition that developed following an accident where a fit ball that she was sitting on burst, causing her to drop violently to the concrete floor beneath. Early on in the book Soula describes that split-second, and the devastating affects that followed. A highly active yoga-loving woman before the accident, throughout the book Soula gives a deeply personal account of the psychological, emotional and physical impacts of living with chronic pain for so many years. These negative effects were compounded by the fact that her condition Pudendal Neuralgia baffled her doctors, and took four and a half years to even diagnose. 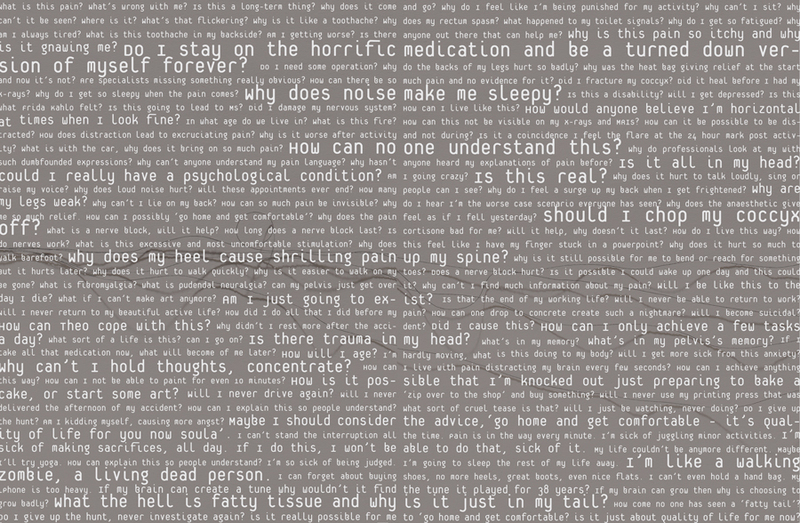 Soula weaves her story through a spare yet effective use of text, combined with evocative imagery that gives visual form to one of the most insidious aspects of chronic pain, its complete invisibility to the outside world. 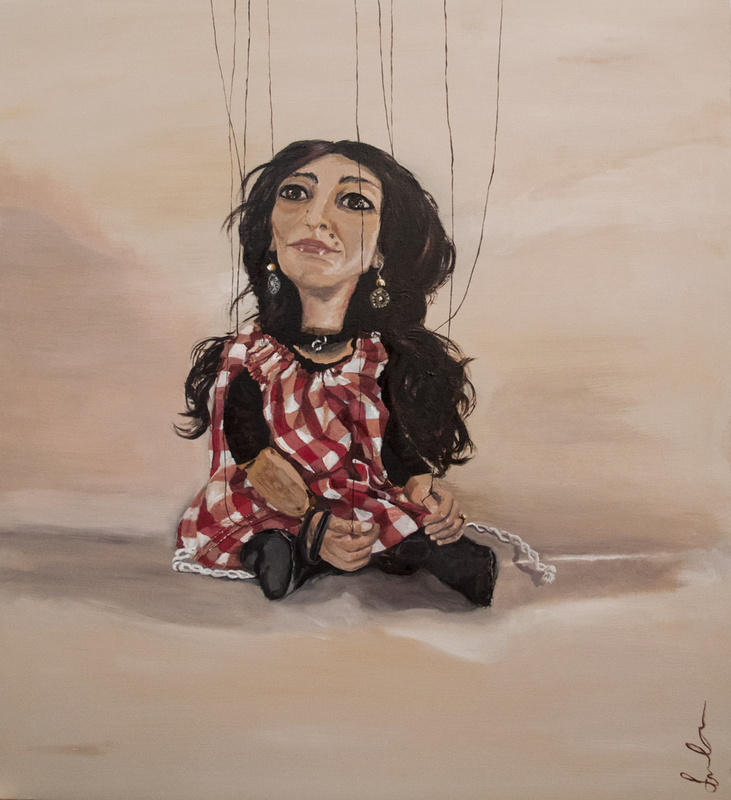 To convey the loss of control over her physical being that has been presented by Pudendal Neuralgia, the artist commissioned a marionette in her own likeness by marionette maker Colleen Burke. The result is an exquisitely crafted and hauntingly realistic version of herself in doll-like form. 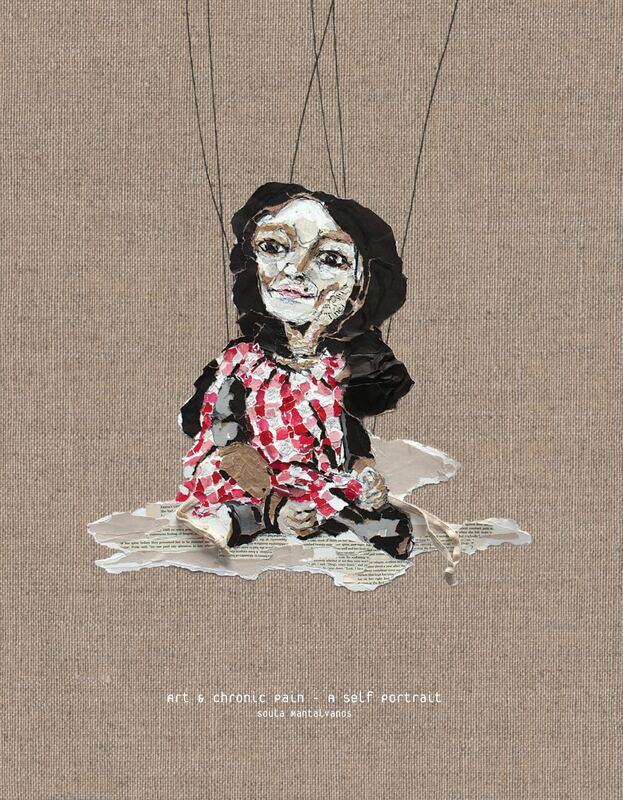 Soula paints, draws and collages representations of the marionette at various points throughout the book. The marionette becomes an effective and poignant device through which the artist expresses sensations that words cannot. Always at the mercy of its strings, these sinuous black threads become an important symbolic motif that visually flows throughout the pages of the book. 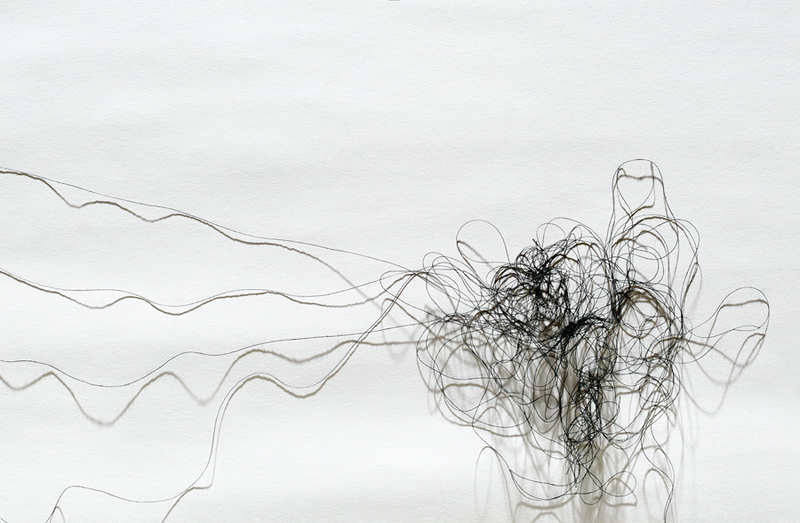 Sometimes the strings appear as a tangled black mess, a metaphor for frustration, unease and angst. At other times they progress in a steadier fashion, casting their winding shadows and creating a sense of spatial depth. Always they unite the words and other elements that appear on each page, such as scrawled hand-writing, drawings and even x-ray details. 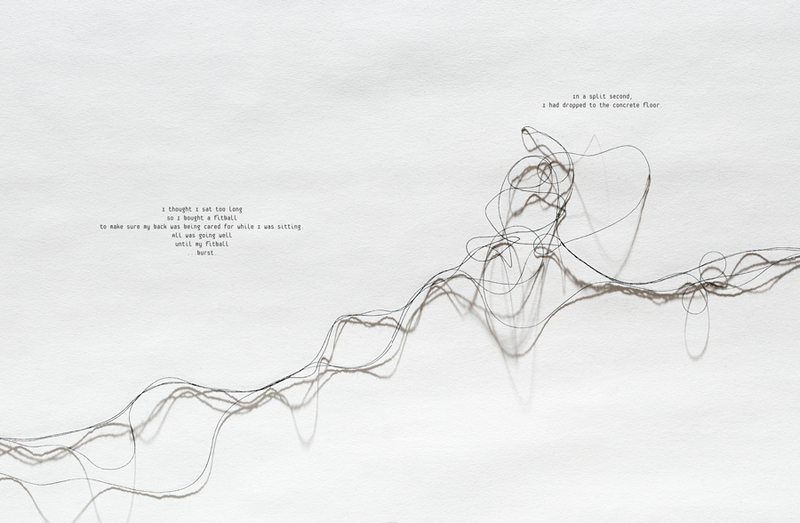 The strings also protrude as real threads from the dust jacket of the book, reinforcing their metaphoric importance in Soula’s story while also functioning as an effective design feature. Employing an understated aesthetic, Soula tells her story with an honesty and resilience that is deeply inspiring. Even at her darkest points, there is no-self pity. This allows the reader to fully engage with her journey, and share in the gratitude she describes through treatments that have provided some measure of relief against the relentless onslaught of pain. Any form of physical illness is essentially a solitary path to tread, yet the experience of one’s own body can form a deep well for the creative mind to draw upon, and thus share that experience with others. In this book catharsis and communication go hand in hand. As well as providing a revealing insight into her particular condition, Soula’s book speaks of art’s ability to aid the spirit in-spite of severe physical challenges. And this in itself is profoundly uplifting. 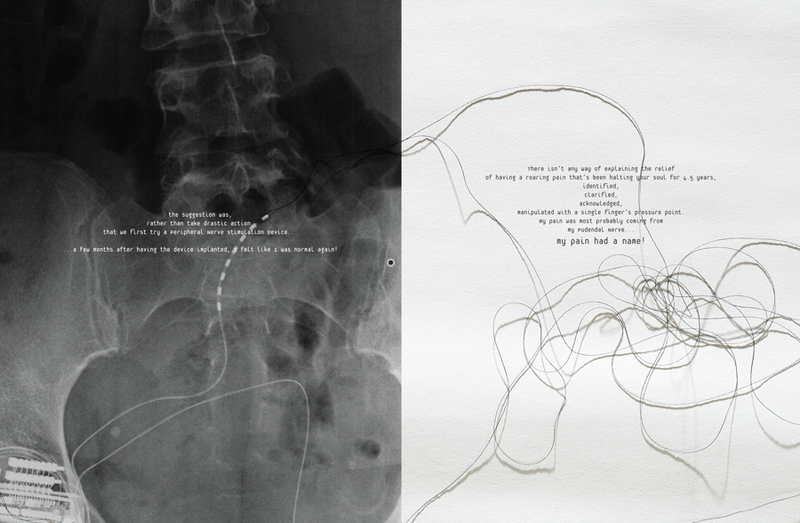 Tags: art, Art Therapy, Artist Books, Artists, Chronic pain, collage, contemporary art, Drawing, painting, Pudendal Neuralgia. Bookmark the permalink. Nice post, I like your blog. Hi! When I’m reading your article Frida Kahlo came in my mind as she was also an artist who got inspiration from her pains. It is good to see that both have turned their pains into something creative and valuable. I’m also writing on arts take a look at my blog too! Thanks Rana, I know it seems that some people have a truly inspirational attitude to adversity. Keep up the art writing!